The SG phoned President-elect of Gambia, Adama Barrow congratulate him on winning the Presidential election. On Thursday December 29 the United Nations Secretary-General Ban Ki-moon called Adam Barrow, the President-elect of Gambia, to congratulate him on his electoral victory and to reiterate the commitment of the United Nations to support a peaceful, timely, and orderly transfer of power. In a readout of the phone call issued by his spokesperson, Mr. Ban said that the UN welcomed and fully supported the decision of the Economic Community of West African States (ECOWAS) on 17 December to support the safety of the president-elect. 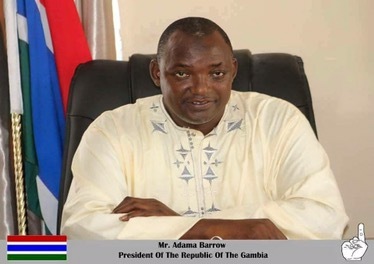 The UN Security Council and the African Union have also expressed such support and have acknowledged Mr. Barrow as the President-elect after he defeated President Yahya Jammeh in elections on 1 December. Mr. Ban encouraged President-elect Barrow to urge his supporters to show restraint and not resort to violence. He emphasized that the UN would support the will of the people in their election of Mr. Barrow as well as the future Government’s in efforts to promote democracy and sustainable development for the country. Despite efforts to reach President Yahya Jammeh by phone, the Secretary-General has not yet been able to speak with him, according to the note. The police requesting the public to seek a permit before moving with a convey is all geared towards creating a reaction from the general public and or the coalition supporters for the outgoing-president Jammeh to have a reason to extend his tyranny. On Monday The Gambia inspector general of police, released a statement on national television demanding the general public to seek a permit before moving in a convey. According to the statement that is to permit a smooth movement of traffic. Meanwhile, all these are Jammeh’s plans. We have seen Jammeh denying the President-Elect Adama Barrow and his team an air time on GRTS since his ill and illegal announcement rejecting and nullify the election results. The President-Elect should be given State protection, but none is given to him still. We have also recently seen pictures of soldiers bringing down the “#GambiaHasDecided” posters across the country. How many times did people went with a convey to “Gamos”, funerals or weeding ceremonies without a police permit? Of course many times and why wait till now, because they want to provoke people into a reaction. We have to be intelligent and do nothing stupid as Jammeh and his gangs are wishing. Jammeh’s intentions are to find a way to provoke Gambians which will create a reaction and in which case he can use the State of emergency laws to extend his stay and avoid ECOWAS from humiliating him by removing him in power by force. However, Gambians have patiently waited for over 22 years before this moment, I suppose we can be super discipline and patient to abide by what ever orders the dictator might give in his last weeks of his authoritarian rule all to avoid giving him legitimacy to rule for more than a second necessary. It’s only 22 days to go before the history making inauguration of President-Elect Adama Barrow. Please lets listen to our responsible authorities, just as Hon Halifa Sallah has said and avoid any thing that will jeopardise our new found freedom. Speaking to reporters on Friday, the president of the Economic Community of West African States (ECOWAS) said West African leaders will send troops into Gambia if the outgoing President Yahya Jammeh refused to step down in January after his suprised lost in December 1st Presidential polls. According Mr Marcel de Souza, if there is going to be any military intervention, Senegal is chosen by ECOWAS to lead it to flush Jammeh out and institute people’s verdict. that the regional bloc has chosen Senegal to lead any military intervention if Jammeh does not hand over power to President-Elect Adama Barrow. “The deadline is Jan. 19 when the mandate of Jammeh expires, if he doesn’t go, we have a standby force, which is already on alert. And it’s this standby force that should be able to intervene to restore the will of the people,” de Souza told reporters. This would not be the first time when ECOWAS intervened in regional crisis, they intervened in Mali in 2013 when the then President Toumani Touray was overthrown. Meanwhile, there are hopes that diplomacy may work to make Jammeh accept his Dec. 1 election defeat. After receiving both local and international praises for his magnanimous act of accepting defeat, Jammeh reneged on his concession to fabricate lies that there were irregularities in the vote count. As a result, he declared on national television that the election is null and void, a power he does not have. However, President-Elect is continuing to receive both national and international endorsement as the Lord Mayor of Banjul, Abdoulie Bah has paid a courtesy call him on Friday. Before which, the Supreme Islamic, Gambia Islamic union, Gambia Christian Council and many more. Why is Parliament Silent on the Political Crisis Gripping the Nation? I write with a deep sense of regret as to the attitude of the National Assembly in Banjul. For the record – The legislative branch is tasked with the sacred “Truth” of enacting laws on behalf of all Gambians, and of executive oversight by upholding the President and the Cabinet accountable for the decisions therein, amongst others. Simply, the Parliament historically came into being, purposeful, sanctified, with a remit to preserve democracy. Indeed, if the occupants of that chamber are true representatives of “The Gambian People” as they have led us to believe and as prescribed in their portfolios, then why the wait? To put it plainly, how long are Gambian MPs prepared to sit and wait before condemning the tyrannical actions Yahya Jammeh embarked on? His actions are unconstitutional, and therefore, illegal under law. His behaviour is undemocratic, and damn right shameful. The tension in Banjul is palpable, as uncertainty exacerbates. The dictator’s 360 degrees U-turn is tantamount to treason, further embroiling the good-Gambia’s image into a tabloid media-circus. Members of the National Assembly – as national and international concern over the situation in Banjul escalates, the Opposition-Coalition sprung to a well-deserved victory in an election described as “free and fair” and “rig-proof” by Jammeh himself. The turn of events thereafter, by reneging on concession, and not following through with the “Transition Process” to the President-elect and his team; has fallen foul of breaching the constitution and all civilized norms of the democratic process along the way. I had expected the “National Assembly” to come out in no uncertain terms to condemn Jammeh’s behaviour. The Gambian people expect their representatives to lead such condemnation in forceful terms. Since that has not yet happened, I have no wonder why the “rubber-stamped” Parliament scores very low in the public confidence ratings year on year. Elected (sic) members of Parliament – grow a fxxking moral backbone and disown Yahya Jammeh immediately. The APRC regime is but a ship with holes sailing across the high seas. As for Jammeh, his like is akin to a roaring lion with no teeth, resorting to scare tactics. But I would like to say, have no fear, and nor should you despair – those with sense are free to relate! The wind of change blowing across the land is UNSTOPPABLE! And as Jammeh begins to pack bags to “Lonely-ville” in the dying days of APRC (mis)rule, Save yourselves and jump ship – to be on the RIGHT-SIDE of safety, and of HISTORY. Many-a-night, I’d wondered the footsteps of gallant soldiers marching across Independence drive towards a national cause at the birth of a “Republic”. On that faithful day in 1970, Banjul became the shining city on an island that captivates, romanticized in folk songs from Dakar in Senegal, to Bamako in Mali. As a plea on behalf of Gambians worldwide, I sincerely call on Members of the National Assembly to disown Yahya Jammeh, and begin criminal proceedings on charges of high-crimes against the state – beginning TONIGHT!